The Latin formula Varia mineralia refers to the mineral regnum, which could be used in different combinations to serve as medicine, shelter, embellishment or alchemical magic. 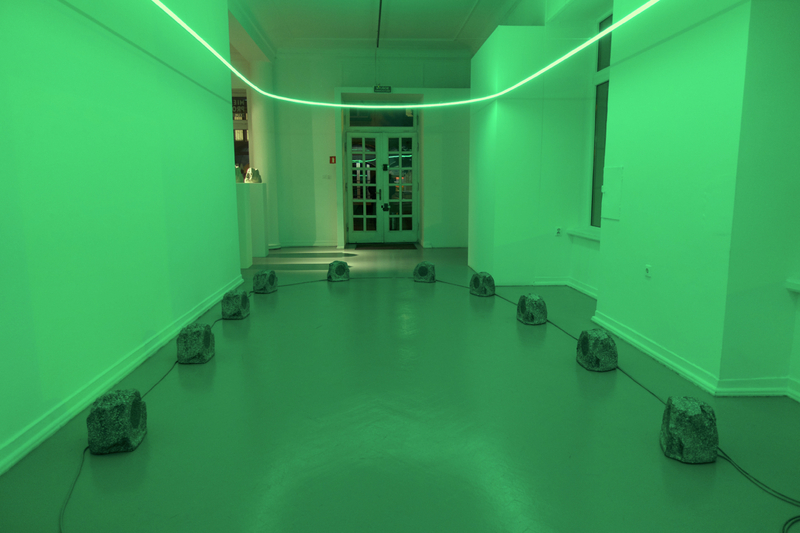 In ‘Aria Mineralia’, an exhibition of recent work by Larisa Crunțeanu, this young Romanian artist has created an artistic project in which the regnum encounters the human voice in an artistic alchemy of hope. Semantically multi-layered, the core idea in ‘Aria Mineralia’ emerges from a found object: a stone-shaped speaker. During a spontaneous walk in Bucharest, Larisa Crunțeanu and Sonja Hornung (the two artists have been collaborating on projects since 2015) encounter a peculiar object that looks like a stone. Although this striking object has the form of a stone found in its natural environment, it is to be used as a loudspeaker in the public space of the Romanian capital. The uncertain status, nature and function of this stone-like entity initially intrigued the artists to such an extent that they decided to listen carefully to what the object might have to say about what it is and what it stands for. 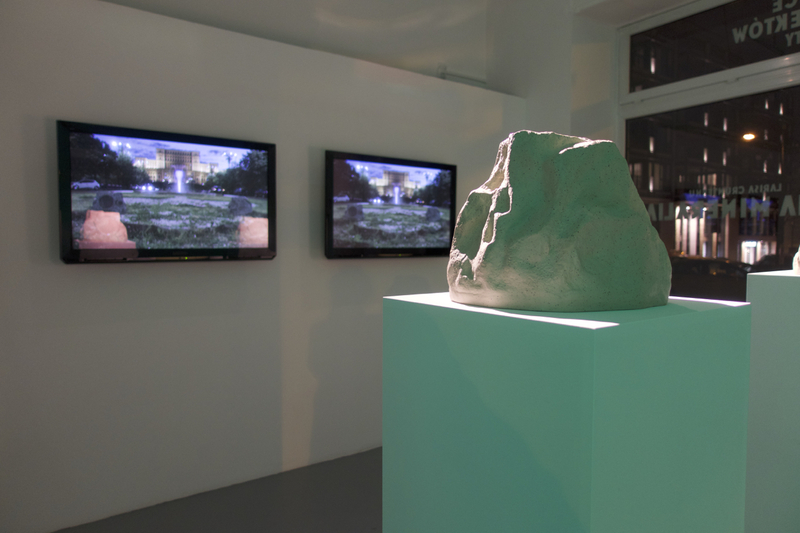 Thus, the objet trouvé – which can easily be taken as a loudspeaker, a stone, or whatever ontological in-betweenness – becomes a sign animated by the meaningful encounter with both the artist and the public of ‘Aria Mineralia’. ‘Aria Mineralia’ thus emerges from an ostensibly artificial object that triggers questions about displaying and revealing what we loosely call ‘natural’ in our social and political life. The exhibition addresses a multifaceted set of questions, some of which might fit within analytical philosophy of a natural kind, while others reveal the artist’s interest in the way we know and understand the world around us by giving objects a chance to speak out. What is the relationship between ‘natural’ and ‘artificial’ environments? What is the status of an ordinary object in art and nature? Can artificiality somehow speak out against the conditions that have produced it? To what extent does what we call ‘natural’ embroil a certain degree of symbolic violence? We all know that the ‘naturalness’ of nature is prioritised over imitations of nature. The stone-shaped loudspeaker imitates an actual stone while standing for a ‘real’ one; at the same time, we still bear in mind its non-naturalness. The artifice is also reiterated in two ceramic sculptures modelled on the form of the original, found stone-shaped loudspeaker. This Untitled ceramic object (realised in collaboration with Olga Milczyńska and August Studio) refers to the phenomenon of imitation or forgery. Without embracing the naturalist theory of modern science, ‘Aria Mineralia’ reveals a semantics and politics of the natural kind, including here stones and other varieties of mineral. 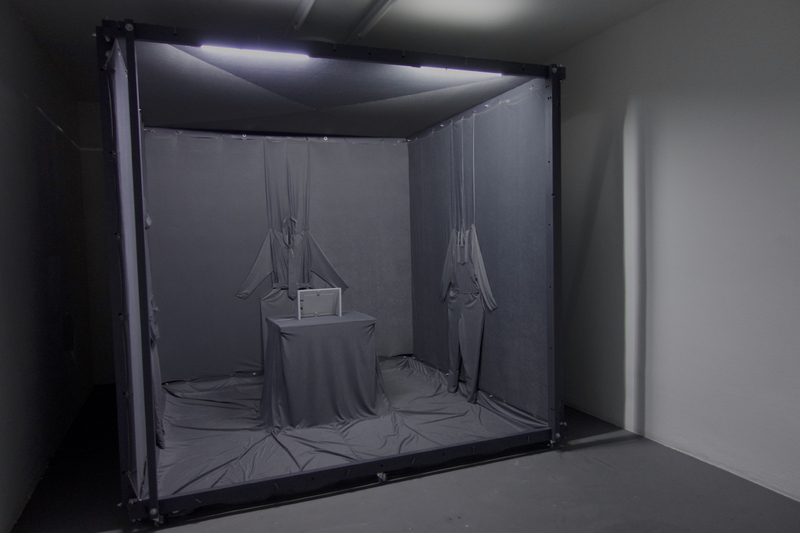 The presence within the exhibition of an installation entitled A Conversation between Three Workers is revealing in this sense. This mixed media installation (a collaboration realised with Magda Vieru and Octavian Hrebenciuc),  is inextricably linked to the main concept of ‘Aria Mineralia’, occasioning reflections on the condition of materiality, the natural/artificial dichotomy, and work and non-work time. The three pieces of clothing (which look like corporate uniforms) remind us that they are not just cloth but vessels of the bodies that contribute to the materialisation of personal and collective memories of onerous work, injustice and alienation. Thus, the three fabric items – all of which are just the size of the artist herself – become 'a conversation between three workers' whose worries, ideals and wishes are self-reflectively shared with the visitors of the exhibition. The materiality of this conversation is not without significance. Concerns related to the natural/artificial materiality of objects, environments and states of affairs also monopolise the debates around the mineral sources of some of the textile pieces. What, if any, is the difference between natural textile clothing and synthetic clothing when both can function as vessels of our corporeal memories and identities? Why do we tend to value natural (organic) textiles when only synthetic ones are actually elastic enough to hold together all three workers and their wearable office? This installation – like all the other works displayed in ‘Aria Mineralia’ – draws on the same ontological in-betweenness that triggers intricate conversations about post-essentialist philosophical positions by eradicating the idea that an object ‘X’ possesses a set of attributes (properties) that make it what it fundamentally and essentially is. Visiting ‘Aria Mineralia’ was like entering a space of upturned day-to-day communication. 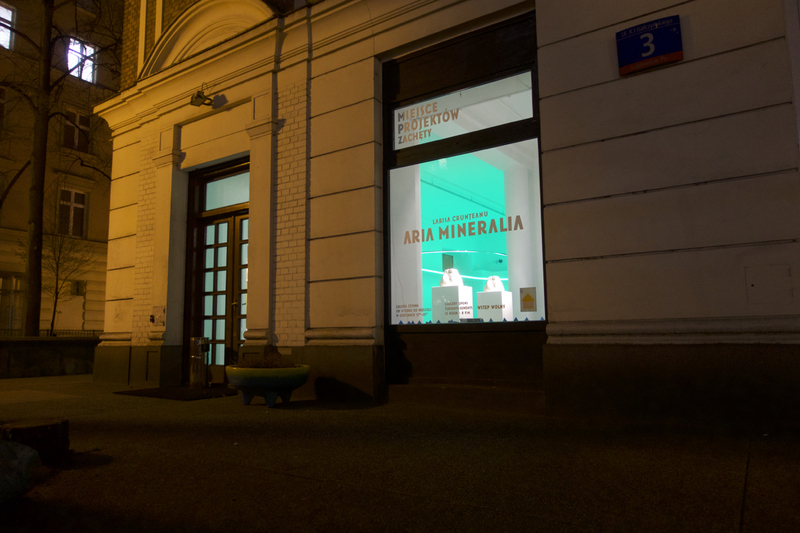 As the curator Julia Harasimowicz posits, ‘Aria Mineralia’ might appear an absurd imitation of human voices that brings to mind ‘a different theory concerning mimicry – its cultural aspect being described as making (often for manipulation purposes) certain symbols, behaviours similar to those present and positively reinforced in the consciousness of a given group’. 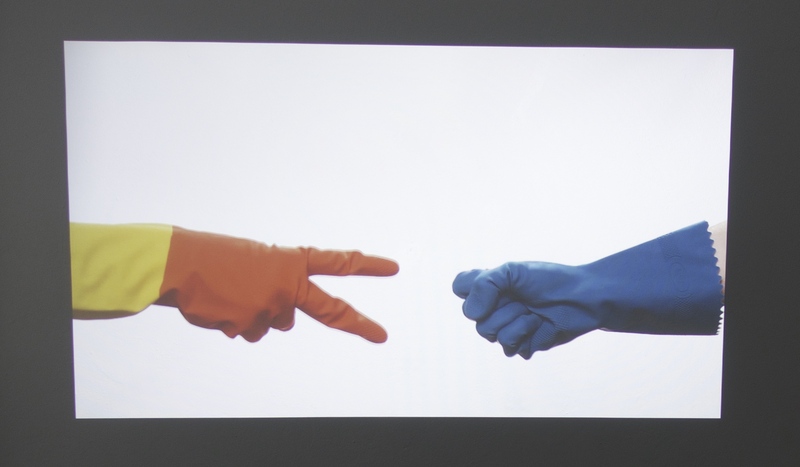 In the 2017 video A Story with 255 Possible Parts (realised in collaboration with Alexandru Dan and Iulian Stanciu), the universal hand game Rock/Paper/Scissors is reinterpreted to ontological and political ends. The childlike qualities of the game allow the viewer to see two hands camouflaged in colourful household cleaning gloves. The shape of a rock (a closed fist) can sometimes beat the other player, but it can lose in confrontation with paper (a flat hand). The winning hand changes the colour of the glove, reminding us that the winner takes all. A Story with 255 Possible Parts displays narratives of victory and defeat, as well as of labour and making (un)biased group decisions. The working hand wears camouflaged cleaning gloves in a survival mechanism of blending in with its work or game surroundings. Gazing at the playful hands covered by the coloured gloves distracts from our perception of a ‘bare hand’. The hand as we used to know it, and the playful glove-covered hand, reveal irreconcilable anatomies that convince us to suppose that they belong to different or even divergent anthropological types. 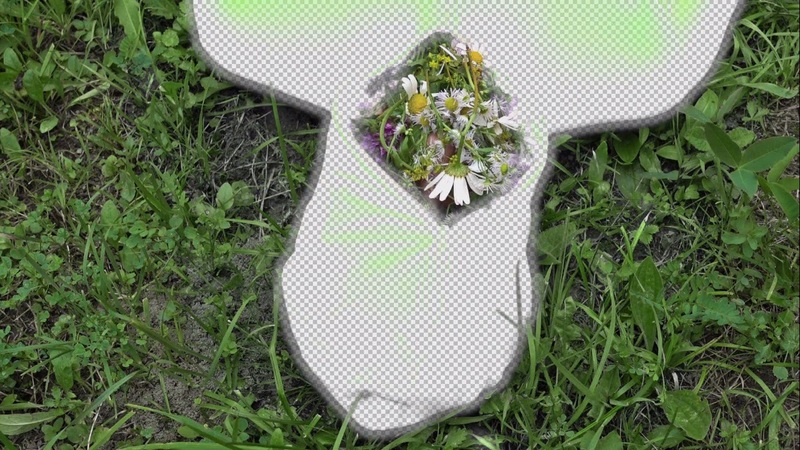 Our natural/artificial connection with nature is also revealed in the 2018 video No Image, No Camouﬂage (realised in collaboration with Laurențiu Coțac and Oana Dorobanțu). In this, Larisa Crunțeanu wears a dehumanising SFX suit. The contours of her body blend in with the surrounding landscape to such a degree that they become part it. At one point, the SFX suit opens up as a chest wound filled with herbal medicinal plants and flowers. The phenomenon of camouflage is not necessarily a strategy to conceal existence and presence. The artist’s body is not merely disguised as a natural environment but, rather, disintegrates and dismembers, like Orpheus, into the surrounding landscape. During the performance, we notice that our referential system is not always able to disentangle the indefiniteness of nature and the definiteness of human nature. Facing this anthropological and ontological indeterminacy, ‘Aria Mineralia’ speaks volumes about contemporary fears of depersonalisation and alienation against a background of copies of a copy. Textile clothing usually consists of one of four sources (vegetal, animal, mineral and synthetic). Mineral, animal and vegetal textiles use natural materials while synthetic materials (acrylic, polyester, nylon) are not regarded as body friendly.